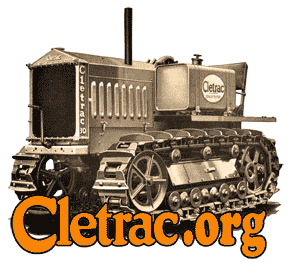 Many of us who own Cletracs are using them and restoring them over time. There is not a whole lot of guidance or standards for restoration, especially if you wish to do an authentic restoration. If you see value in developing a restoration guide, which includes decal and logo size, content and location for your model and year, please answer the attached poll. I've been a member of MAFCA (the OTHER Model A) for years, and they have very specific standards for restoration. Nice to have some guidelines to compare to. I don't envision that level of documentation, but some basic answers to questions in one place. Great idea John! Once the information is compiled, there needs to be a designation as to whether the information is absolute truth or if there is a possible descrepancy. I have just seen too many instances of tractors being different and both are right. I think we sometimes forget these were made as work horses and paint finish and continuity of stickers were of secondary importance at the time. A paint supplies was telling me that although lots of ferguson parts supplier sell Ferguson grey paint advertised as being the right shade of grey, there was no fergy grey they made some many of them that they brought paint from three suppliers at a time and only specified that it be grey. I do think a guide would be usefull though! I live in England, got interested in Cletrac's when I brought an Oliver BD in 2001, I now have an Oliver BD a Cletrac BDH and another BDH for parts and have just brought a 1919 model H. I also have a british built Track Marshall 90. Always keen to hear from fellow collectors. I guess that's why I called them guidelines - in the Accounting world, they have a phrase "Generally Accepted Accounting Procedures" (GAAP). The paint discussions alone (what is Cletrac Orange??) indicate the variations. Even getting reliable sources of Serial Numbers by Model and Year are tough. This is why we have a forum - lots of discussion, occasional consensus, and opportunity for all to put in their 2 cents worth.. The info will be guidelines - stated facts where possible; opinions too. Conflicting info will be noted as well. How many OC-? 's do we know or think we know are in restoration? I'm renewing an OC-3, no serial number, engine was swapped out previously. The "Chocked Full of Nuts OC-3"
OC3 "Chocked Full of Nuts"